This is Macd Trading system which works with good old classic indicator MACD. As you can see the results is very nice and straight to the top! Test period was ~15 years on tester, which worked stable on EUR/USD with every tick mode. 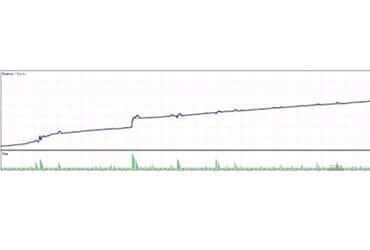 This is the latest tick data history downloaded. Results are great. This version also has a memory system and keeps profit stable with its neat source code! The main idea of successful forex trading is good Money Management. We use our unique way to control the risks – when auto trading. It is like a “lot” size increase with every loss, but nothing like martingale at all. The system raises “lots” by small pieces and leaves the user full control of an account total stop-loss. You can always turn off the lot raising mechanism and trade with fixed lot size as well. Since our entry points are accurate and simple enough you can still get good results, and maybe even find some better settings while testing or trading live. Every version of our software is able to trade with any time frame and any currencies pairs as well as stocks, metals etc.. All Forex EA’s can even trade multiple pairs at the same time separated by magic number. The software has special memory system which creates memory files and logs the trading process, so you never lose your trading cycle in case platform crash or connection is lost.